A website to simply find help. Switzerland has 8.3 Million inhabitants. It is a multicultural country with four official languages. The range of social services is wide. However there is no overarching database on all cantons and all issues (such as meal service for older people, mobbing at work, addiction & youth and many more issues). Thus, internet search for the right social service is cumbersome and time-consuming. 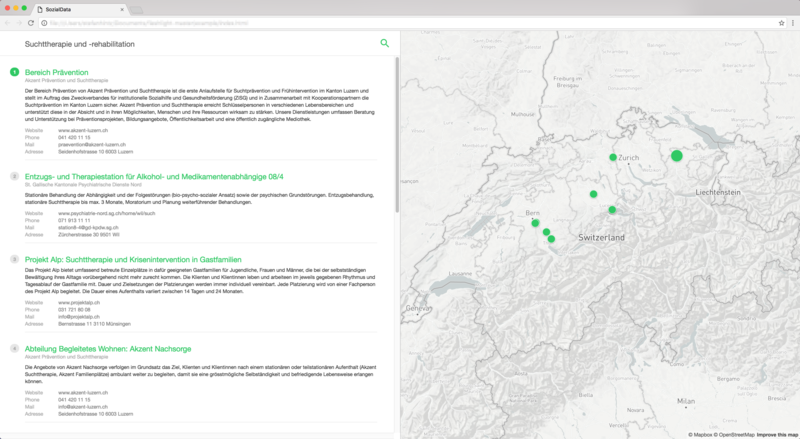 On the AAL-hackathon our team created a prototype of a user friendly directory to find all social assistance to the topic of addiction within Switzerland (based on infodrog.ch). The further goal is to build a national wide database. This database aims at simplifying the current situation, where each city, canton or social association maintains its own data. Future Apps can link on this database helping people find the social services they need. We are looking for supporters of the project of a national database about social organisations. Pleas contact us for further information.